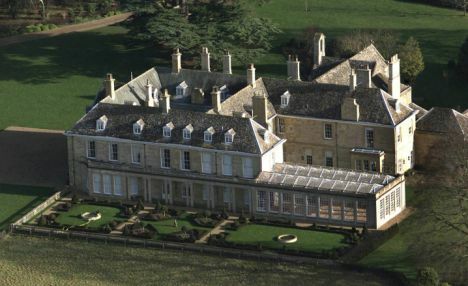 Sarsden House, near Chipping Norton, Oxfordshire, was rebuilt by William Walter in 1689 after a major fire. In 1792 James Langston inherited the house and commissioned Humphry Repton to carry out some remodelling and to landscape the grounds. In 1823-25 Repton’s architect son George Stanley made further alteration for the younger James Langston. 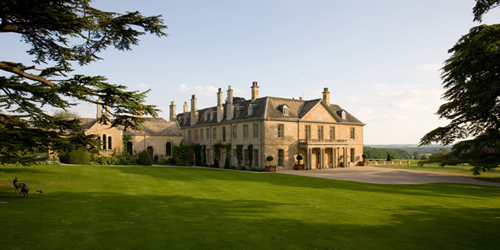 The house is faced with limestone ashlar with rusticated quoins and has hipped stone slate roofs. The main block was built around a central open well, which was later filled in by Humphry Repton. It has projecting wings at right-angles to the rear forming a U-plan. It consists of two storeys with an attic and has a continuous moulded floor band and plinth. 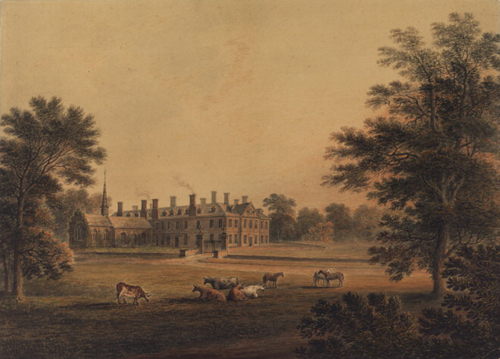 The watercolour by John Glover (above) shows the house from the NE before George Repton worked on it. At that time the north front consisted of 2:3:2 bays and had a central pediment with foliage carved in high relief flanked by oeils de boeuf. It now has a balustraded portico, which was added to the centre by Repton, and has four pairs of Ionic columns supporting a moulded entablature with triglyph frieze. The half-glazed double doors in the centre are set in a late seventeenth century enriched doorcase with carved garlands and husked wheat to the sides and a bearded head as the keystone. 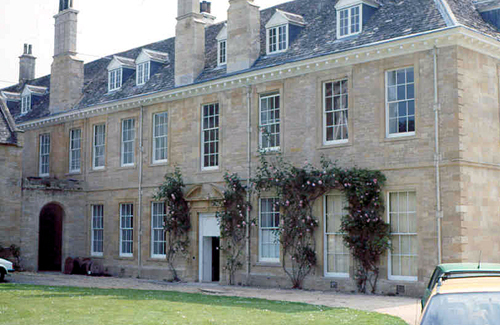 The east front has nine bays with sashes set in plain moulded architraves, some enlarged and including a 15-paned sash to the fourth bay from the right on the first floor. The doorway is similar to that on the entrance front but it has a segmental broken pediment and a 6-panel door (opening to the bottom 4 panels only) in a fluted pilastered wood surround. This front links the house to the NW corner of the Church of St. James. A late eighteenth / early nineteenth century service range projects at right-angles to the east on the south side of the house. This has a hipped roof with a plain parapet. A further single-storey hip-roofed extension projects to the south. The west front has eight bays and a full-length balustraded loggia by George Repton supported on five coupled Ionic columns with single Ionic columns at each end. Attached to the right end and flush with the loggia is a conservatory also added by George Repton. This has a double-span glass roof concealed by a balustraded parapet at the same level as that of loggia; nine 32-paned glazing bar sashes to the west and four to the south side, all in plain moulded architraves. The conservatory was ruinous when I worked on the building, but has since been restored. Amongst other things, the interior contains a central rotunda which is the work of Humphry Repton. This has eight Roman Ionic columns supporting a simple dentilled cornice and a plain twice-sunk coffered dome with plaster guilloche decoration to the ribs surmounted by a stained glass lantern. The entrance hall to the north of the rotunda has a Roman Doric distyle in antis screen to one side. The morning room, to the left, was largely remodelled by George Repton. It has a white marble fireplace with panelled pilasters and husks to the sides and a frieze of grapes and a spread eagle. There is also a double-darted egg and dart plaster cove to the ceiling. The library to the right of the entrance hall has Corinthian marble columns in antis forming columns to each end. It has a white marble fireplace with a frieze of Vesuvius erupting by moonlight probably by George Repton. 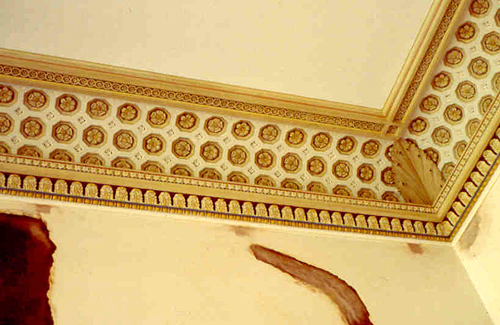 It has a plain plaster cove to the ceiling with delicate guilloche moulding. The library leads to an ante-room on the south, which in turn leads to a drawing room, both with white marble fireplaces. The dining room, which is south of the rotunda, also has an elaborate white marble fireplace. 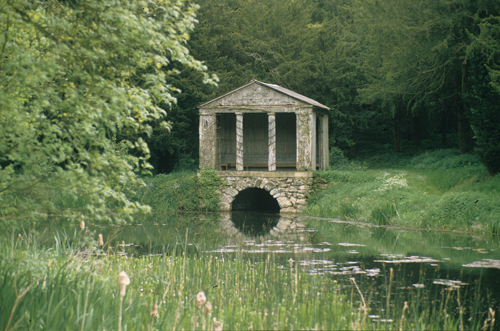 As part of the landscaping carried out by Humphry Repton in 1795 a serpentine lake and a Doric temple were added. During the Second World War the grounds of Sarsden House were occupied by British and American soldiers. In 1944 the HQ for CCB Company of 6th Armoured Division, US Army, was billeted in Nissen huts and the upper floors of the house itself – the home of Lady Wyfold – became the officers’ accommodation. The soldiers left behind vivid murals illustrating their memories of the village – sadly these are not on public display! For much more information please visit the Heritage Centre. The house was extensively refurbished in the 1990s and I was asked for advice on a number of the interiors. In the 1940,s my scout group 5th Chipping Norton used to camp for Easter weekends. We played at being pirates on the lake but could never clamber up on the circular island. We invented stories about a strange house on that island with odd parties that eventually set the house on fire. I should love to know if any of this were true. Lady Wyfold was always very helpful to us and I wondered what happened to her? Did she sell the estate? Thank you Richard. Yes. The house has been sold several times since. I don’t know who is there now. The house is owned by Tony Gallager, a property developer. I visited 4 years ago whilst researching my family tree and was shown around the house and gardens by the Butler! I have many photos if anyone is interested.